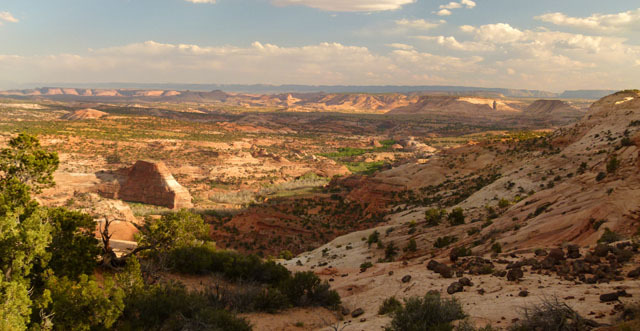 Hayduke Alt: Via Escalante East (Upper Muley/The Gulch) – Across Utah! IMHO this northern option isn’t quite as spectacular as the Choprock/Harris option, but it’s likely 1-2 days faster. 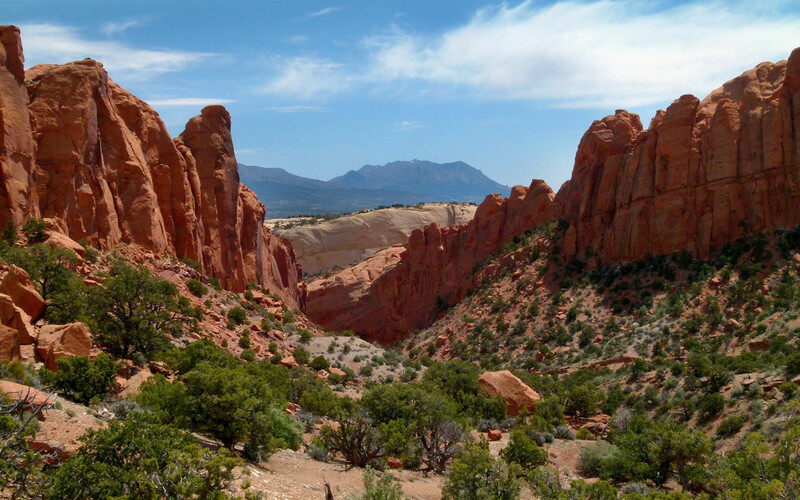 The northern option for this alternate also starts at the top of the Burr Trail Switchbacks, but instead of going down Lower Muley Twist, one should go up Upper Muley Twist. To do this, simply follow the road around the bend and then stay in the wash as it turns north. 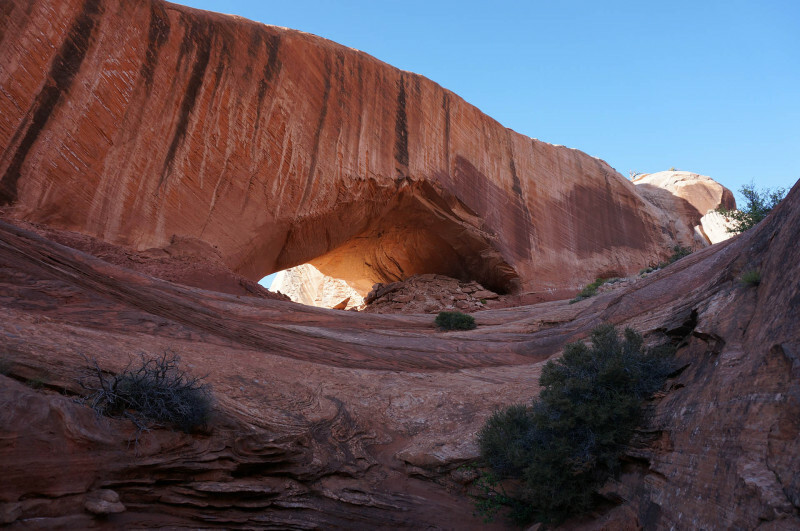 Soon one will pass under Peek-a-boo Rock before a side road joins the wash for 4x4s wanting to drive to Upper Muley Wash trailhead. Continue up the wash along the road most of the time but occasionally following a footpath to cut a few bends. 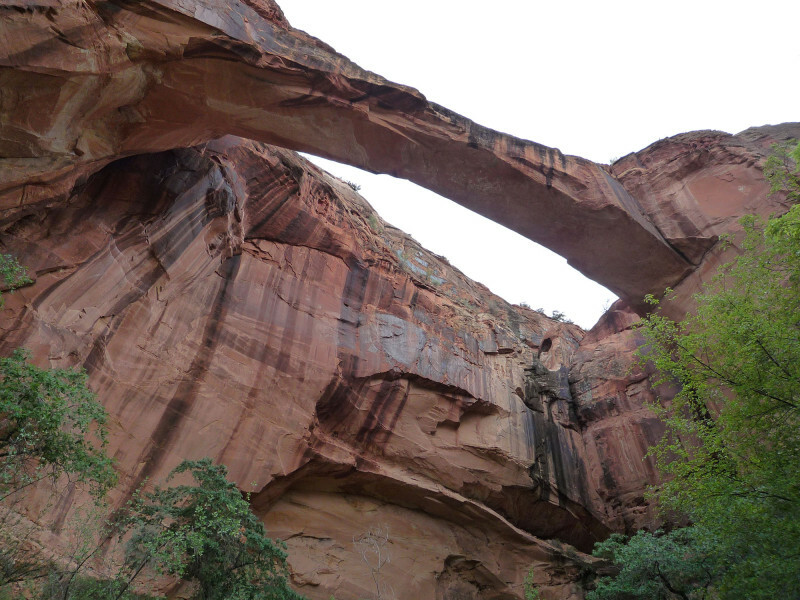 After just shy of 2 miles make sure you notice Trinity Double Arch on the western outcrop of rock. 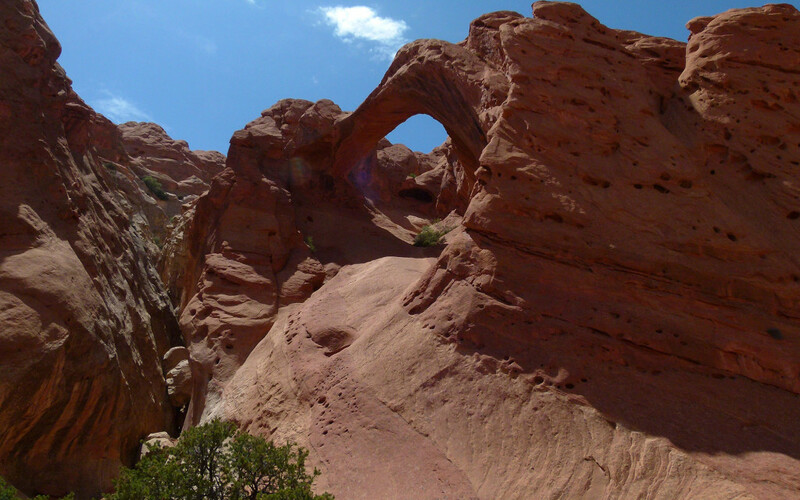 Just past this point is another Double Arch high above. 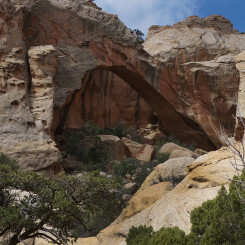 A third arch is supposedly high in this same outcrop of rocks, but I’ve never been able to spot it. Continuing up the wash it’s just over another mile before the one reaches Muley Arch. Look for it on the left set back a way from the wash. In just a few more bends one arrives at the spot where the Rim Route leaves the wash on the right and climb ups the cliffs. 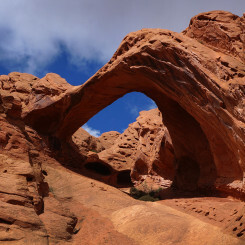 On the opposite side to the west is Saddle Arch. 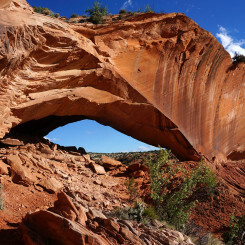 Scamper up the hill for the best view of this impressive arch. The Rim Route is an incredible walk. 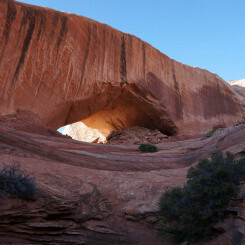 If you didn’t check out the Strike Valley Overlook I’d say it’s worth the extra hour or so (though you will miss a few arches.) 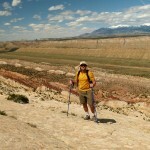 But, for the quickest route continue hiking up the wash.
For much of the season Upper Muley Twist is completely dry. 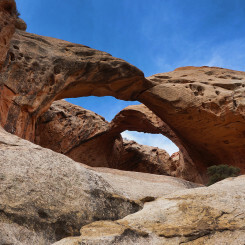 After rains you might see some potholes — especially if you explore the short side canyons/tanks on the west side of the wash.
About a mile north of Saddle Arch, Shy Arch will come into view high on the western flanks. Just past this point is a large gap in western reef. 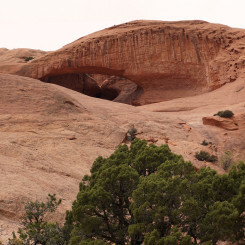 Dome Arch can be seen on the next flank to the north. 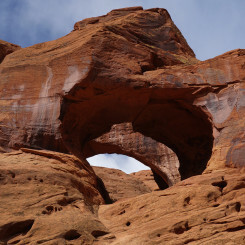 Continue to the right up the main canyon under Dome Arch. In less than another mile another canyon enters from the west. 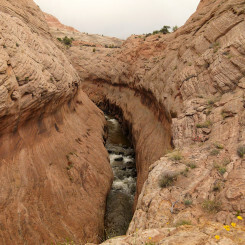 At the very bottom of this canyon is Cap Arch. 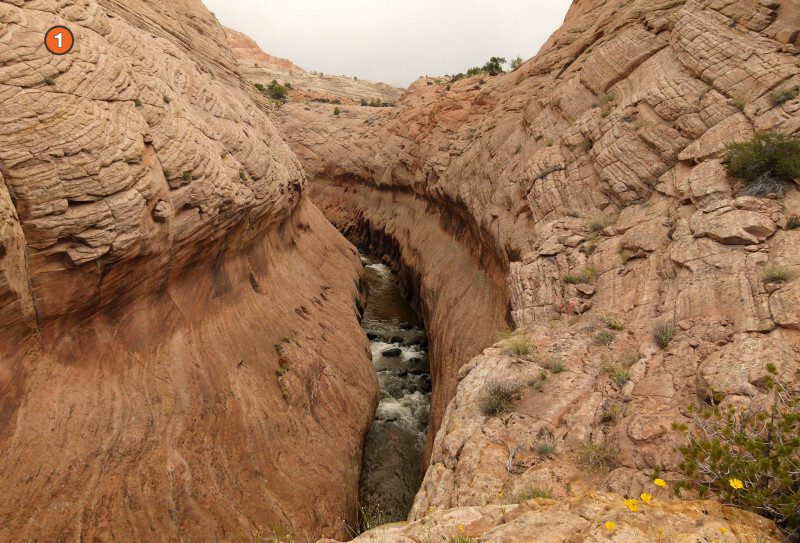 This is also the canyon that this route takes to exit from Upper Muley Twist. 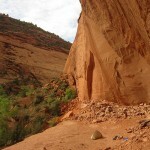 But… before that, one may want to drop their pack and explore another 1/2 mile upcanyon to see the Upper Muley Slot. 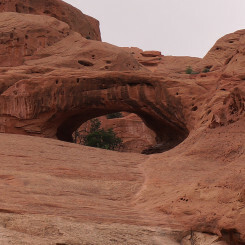 Just below this slot is where the Rim Route returns to the wash.
Back at the exit canyon, head up past Cap Arch. There’s a minor scramble or two in the lower part of the canyon. 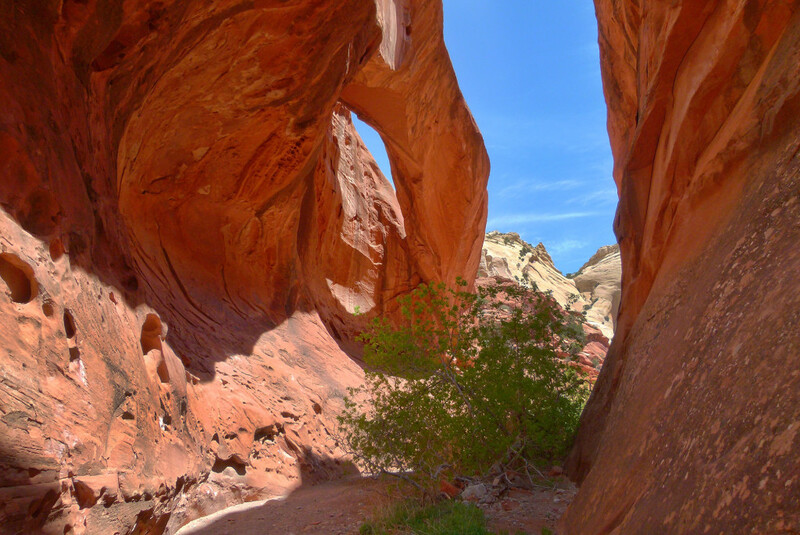 As the canyon begins to open up one will find it choked with large boulders. This will require more scrambling, but nothing major. Soon it will be best to leave the wash on the right and climb up the steep incline headed up to the saddle. Make sure to turn around to enjoy the view back toward the Henrys. Once at the top it’s necessary to scamper down the steep cliff and cut across the top of another major drainage. 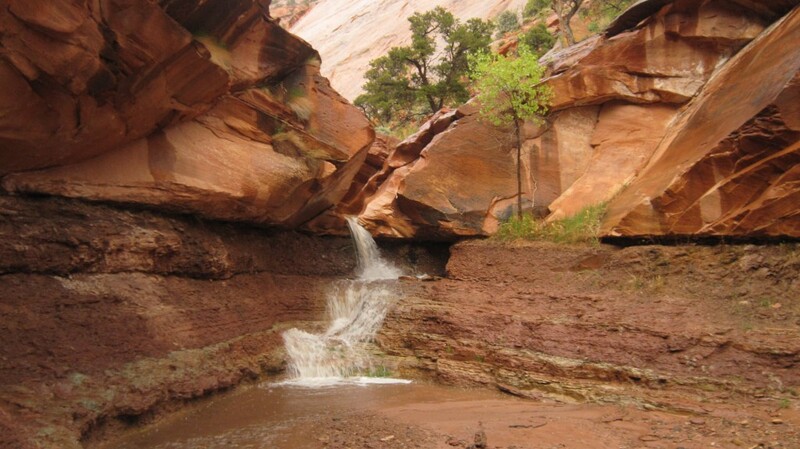 BTW — one can decend this drainage to get back down into the canyon above the Upper Muley Slot and see the upper upper slot and its old mining claim graffiti. The road continues N following the western edge of the reef before turning abruptly to the west. 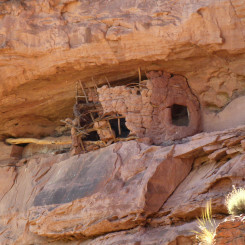 Soon the main road will continue down between two mesas, but a less-traveled road heads NW. Take this road and continue following the reef. 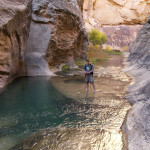 In about 1.5 miles the route enters a wash which can be followed another mile or so where a few washes come together. Brinkerhof Spring is about 3/4 mile NE of this spot. 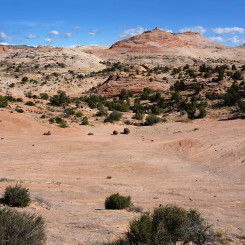 Once out of the wash, leave the road and head due west through the sagebrush and follow the northern edge of the Circle Cliffs. In less than a mile you will intersect the road which will make travel faster. In less than another mile you will be just south of the feature known as the Lampstand. There’s good waterworks in this area south of the road. From here one needs to get about 5-6 miles over to the spot where it’s possible to access upper Egg Canyon. 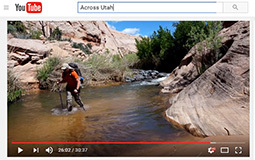 The easiest way to do this is just follow the well-traveled back road making sure to NOT take the northern branch which leads to the Upper Gulch. 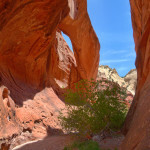 A more direct route is to go cross-country over the hill tops or follow the upper branches of Horse Canyon. Walking is pretty easy in this area, but don’t expect to find any water. The back road ends at a turn-around, but follow the abandoned road higher into the hills and eventually over the saddle into Egg Canyon. 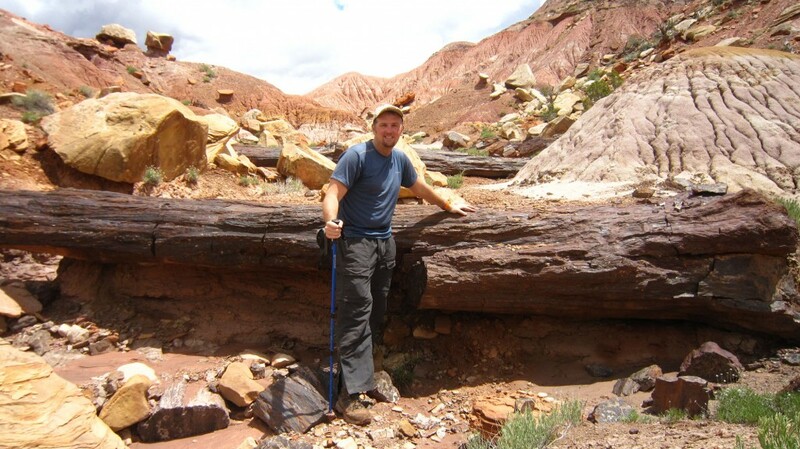 At the saddle and then on the way down the canyon you will likely see a bunch of petrified wood — even entire logs if you seek out the correct side ravines! 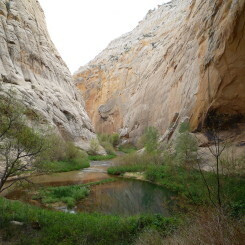 After about 2 miles down Egg Canyon you will arrive at the Upper Gulch. 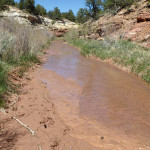 Water is likely to be running here, but if not, chances are it will be down canyon. 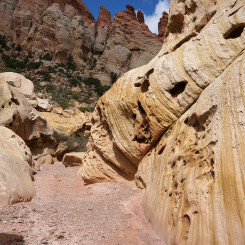 Walk in the wash or along the cow trails which cut across the benches. 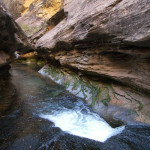 About 2 miles down Water Canyon enters from the west and usually provides a great source of clear water. 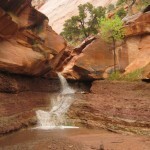 In a few miles the canyon begins to narrow and you will pass a big alcove and then have to bypass a small waterfall. 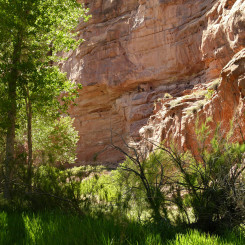 Another few miles you will arrive at the spot where where The Gulch meets Long Canyon and one must cross the now-paved Burr Trail Road. Actually it might be easier to follow the road at this point up to the bend and the TH and parking area for The Gulch. From here the easiest/quickest route is to just follow the well-worn trail south along the stream. 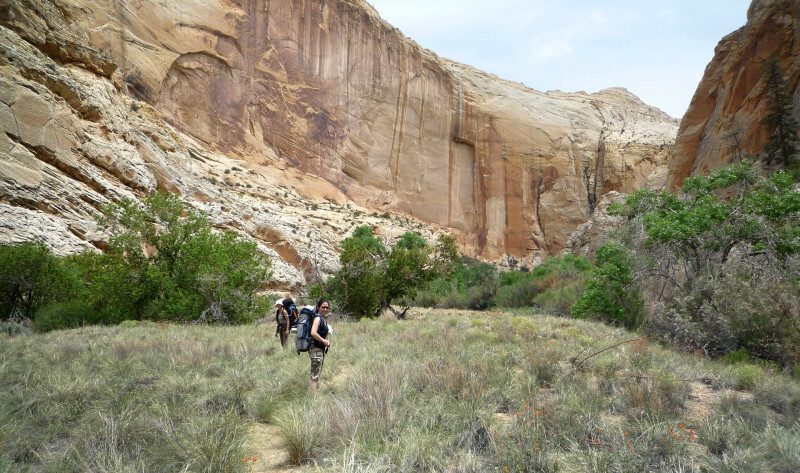 However, a more fun route is to climb the cliffs to the south and find the High Route which follows the ridge separating The Gulch from “Sand Holler” to the west. Not only are the views amazing along the High Route, it allows one to escape the stinky cows that are common in the stretch of the Gulch running below. Eventually one needs to cross over into “Sand Holler”. 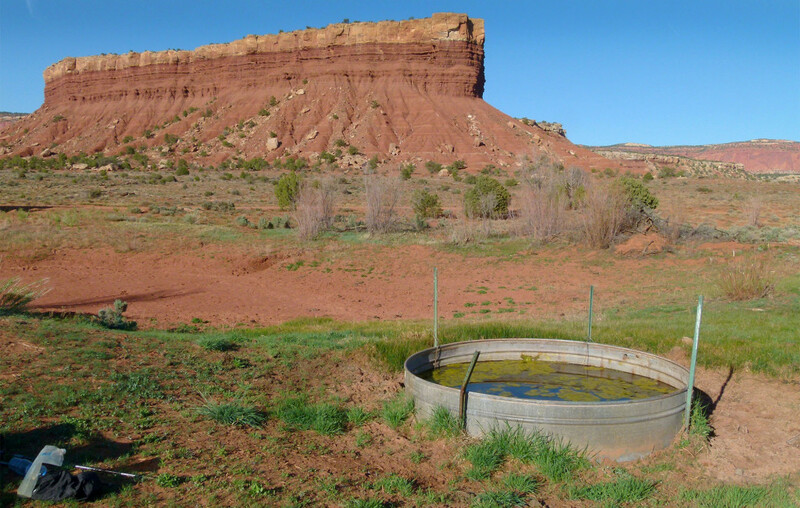 Follow this down and bypass one dryfall which commonly holds a tank of water underneath most of the year. A little farther down climb out of the wash on west and start climbing up the slickrock to the saddle to the SW. There sre a lot of cool balanced basalt bombs in this area. 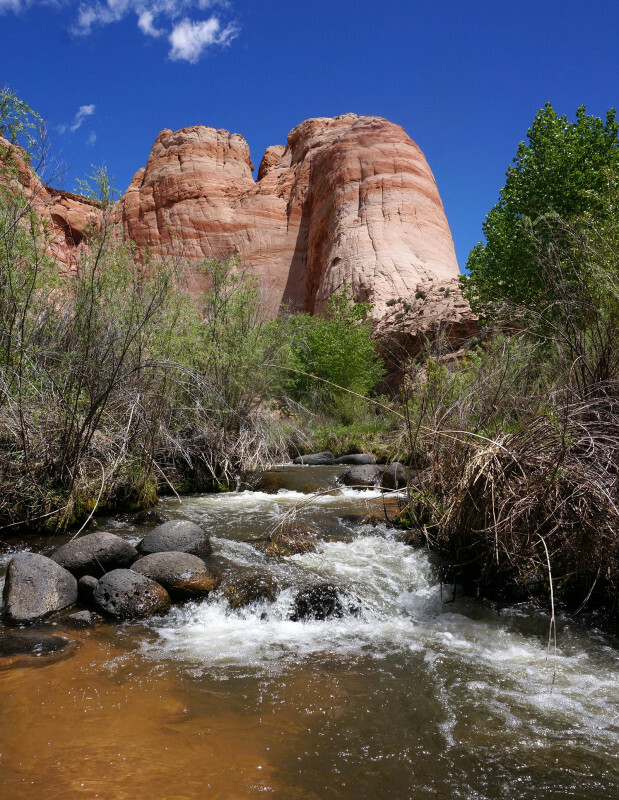 Once up to the saddle, work your way down toward Boulder Creek following a string of tanks. 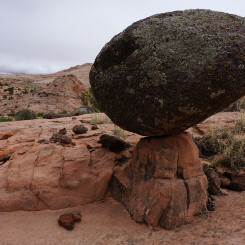 The slickrock in this area is very cool. 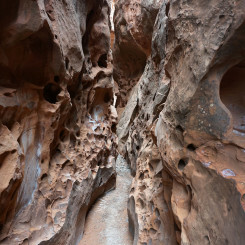 The route intersects Boulder Creek right below the Narrows. 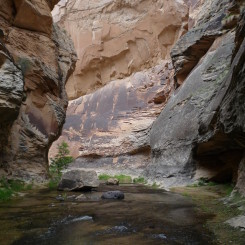 If it’s warm and time permits, drop your gear here and hike the eastern rim up and around and then drop into and descend the Narrows. This often requires swimming for short stretches. Navigating downstream the next few miles is a challenge. 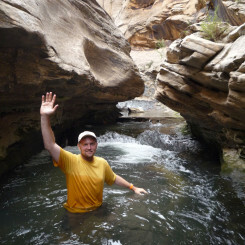 It’s not as bad as the Narrows, but it’s still an adventure and expect to be hiking in the creek frequently with several waist-deep crossings. Guidebook author Allen describes a short-cut through the area, but I wasn’t able to locate it. (Read all about my search for the route.) But, the route down the stream is actually fun so you may not want to short-cut it anyway. After the canyon opens up a little it’s possible to short-cut around a large bend. 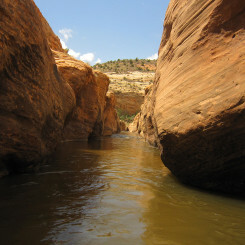 Then one must get back in the water for another mile or so until arriving at the confluence with the Escalante. 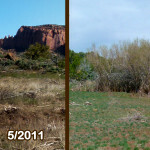 It’s reported that Boulder Creek doubles the flow of the Escalante at this point. Head upstream crossing the river as needed. A fairly well-established trail makes travel fairly quick, though many of the crossings are still frustrating as the river is overgrown and getting up/down the steep banks can be a pain. In about 3.5 miles Phipps Canyon enters from the left. This is where the southern and northern routes of the Via Escalante East Alternate merge. The route description from this point on is the same as the Choprock/Harris route. But… before continuing up the river, one may wish to drop the bag and do the diversion up to see the impressive Phipps Arch (approx 2.5 miles round-trip.) It’s a great place to have a snack underneath the span. 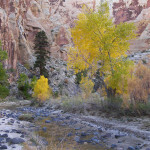 Head upstream from Phipps along the southern side of the canyon. Follow a fairly distinct trail crossing the river once (or three times). Make sure to stay on the official route here to avoid private property. 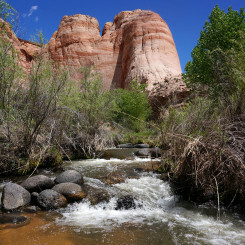 Soon you will be at the the Hwy 12 bridge and the Escalante River TH parking area. NOTE: two granaries can be spotted near the bridge. One on the northern wall just before arriving at the bridge and then one on the opposite wall seen from the bridge. 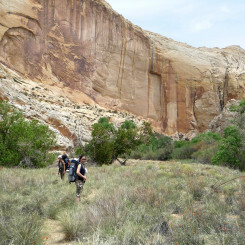 Continue up the Escalante on a fairly well-worn trail that cuts most bends in the river. 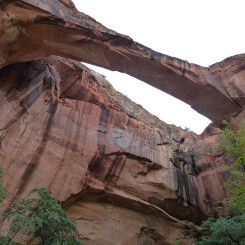 Make sure to not miss the Escalante Natural Bridge on the southern wall about 1.5 miles upstream from the man-made bridge. 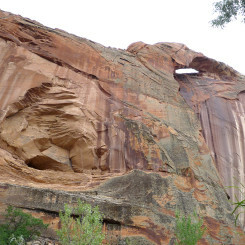 Then around the next corner be sure to spot the natural arch, small ruin and petroglyphs high on the southern wall. Continuing up canyon one will pass Sand Creek entering on the right and then the walls begin to tower more and more. 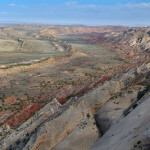 In about 4 miles Death Hollow will enter from the right and provide most of the water for the Escalante at this point. A diversion up Death Hollow will definitely reward those with a few hours to spare. 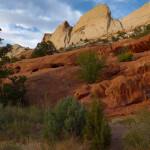 In fact one could hike up to the Mail Route and then continue to Escalante. This is the most scenic way to go, but much longer and slower since you have to manage big packs through the narrows. 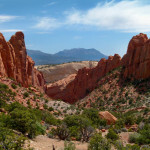 Compare the options in my 2008 Death Hollow Loop trip report. 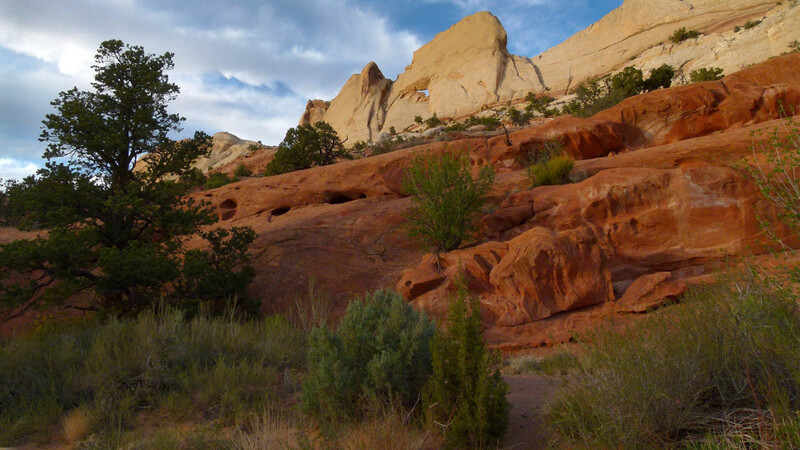 If not opting for this longer option, just continue up the Escalante (which may be intermittently dry by now) for another 8 miles or so. 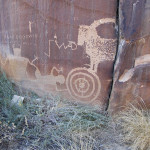 Watch for some more petroglyphs along the way. 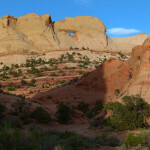 To continue west either hitch down Hole-in-the-Rock Road to re-connect with the official route, or walk out of town on the Smoky Mountain Backroad and connect the Via Escalante West alternate to Grosvenor Arch. 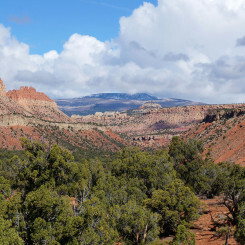 The second half of my Burr Trail Loop Hike (2016) travels much of the route described above. 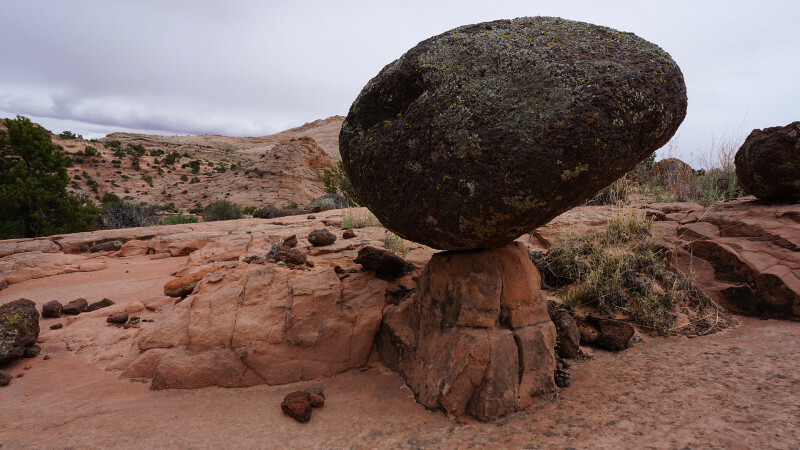 My Boulder to Moab Hike (2013) also covered a portion of the route (Upper Gulch, Circle Cliffs, Upper Muley). 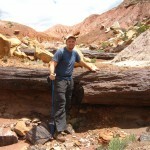 My Nevada to Colorado Hike (2009) went through Escalante and down the river including a side-trip into Death Hollow. 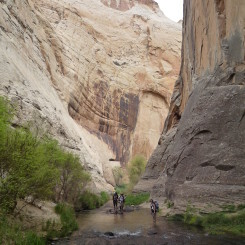 Tagged Boulder Creek, Burr Trail, Capitol Reef, Circle Cliffs, Death Hollow, Escalante, GSENM, Hayduke Trail, Narrows, Slot Canyon, The Gulch, Upper Muley Twist, Utah. Did you mention how long this route is somewhere? I can’t find it. 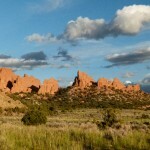 This site has been a hugely helpful source of info for my upcoming hayduke hike, thanks! 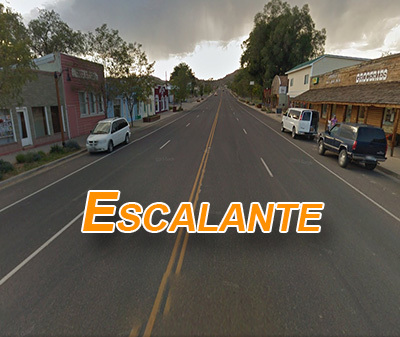 also do you know how long the other eastern route to Escalante is? The one to the south. Hmm… I guess I didn’t state a total mileage. Thx, I’ll go back and add that. The northern option is about 62 miles total and the southern option is about 74 miles (both of these totals include the last 17 miles which is the same.) 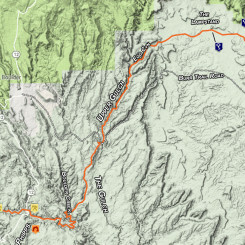 But note that the southern option requires another 11 miles of the official Hayduke down Lower Muley Twist. So… true comparison would be 62 vs 85. One could save time/mileage on the southern route by going down Silver Falls Canyon — but that’s not nearly as scenic. Thanks Jamal I just saw this. A rough estimate is all I really need, I’ll add it to my maps.